CG Sound System has been in existence for thirty-two years and in that time has built a reputation of being one of the nation’s most successful show choirs. The group, originally known as Swing Mates was formed in 1973 under the direction of Judith A. Meeks. Swing Mates, and later CG Sound System (fall 1981) performed extensively for programs on WISH-TV 8, Indiana Music Educators Association and many civic organizations in the city of Greenwood. 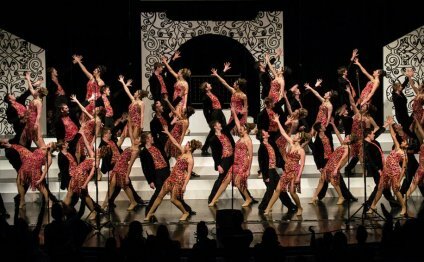 Since competing for the first time in 1982, the group has been named Grand Champion Show Choir at regional and national competitions numerous times and has earned many caption awards. Included in those, are SHOWSTOPPERS National Show Choir Competition and FAME Competitions in Chicago, Orlando, New York City and Branson. In addition, CG Sound System was the first-ever Honors Choir for the Orlando SHOWSTOPPERS in 1991. The group is under the direction of Jennifer Dice and choreographed by Andy Haines. They are assisted by Jared Norman, Greg Sanders and Sheila Leachman. CG Sound System is proud to represent their school and White River Township as they work to provide consistently excellent and timeless entertainment to audiences across the country. Judith A. Meeks forms a group known as Swing Mates. The group is a mixed intermediate choir comprised of freshman through senior students. The choir was meant to perform concert and swing choir literature and performed at major high school concerts and for civic and community organizations. After establishing Swing Mates in the Center Grove Choral Department, Judith Meeks decides to begin investigating taking a group into competition. After attending the Luers Midwest Swing Choir Invitational, Judith decides to make some changes in the choral program to ready Swing Mates for competition. Swing Mates is made Center Grove’s varsity choir; the group is auditioned to compete in the Spring of 1982 at the Luers Midwest Invitational. Former member of Swing Mates, Marty DeMott is asked to choreograph the choir. Swing Mates compete for the first time. The group placed 14th overall and won Best Instrumental. Swing Mates name is changed to CG Sound System for a more competitive edge. CG Sound System is named Grand Champion at Jasper Invitational earning the caption for Best Male Soloist (Danny Evert); Grand Champion at Martinsville Invitational, Best Instrumental and 9th place at Bishop Luers. 11th place at Bishop Luers, Best Male Soloist (Danny Evert); 4th place at Watseka, Best Choreography; 3rd place at Jasper with Best Male Soloist (Danny Evert). Chris Miller joins Center Grove HS as the Choral Accompanist and begins arranging for Sound System. Grand Champion at Mt. Zion earning captions for Best Choreography and Best Male Soloist (Danny Evert); Grand Champion at Watseka, Best Male Soloist (Danny Evert); 2nd place at the Plymouth Invitational. At the conclusion of the school year, Marty DeMott resigns as the choreographer for CG Sound System. Danny Evert is hired to take over as choreographer. 3rd place at Pekin HS, Best Vocal Sound; Grand Champion at Watseka, 3rd place at Delta; 4th place at Mt. Zion HS. 6th place at Kankakee; 5th place at Watseka; 2nd place at Pekin. Chris Miller leaves CGHS on sabbatical. 11th overall at Pekin; 6th at Kankakee; 9th overall at Bishop Luers; 5th at Mt. Zion; 6th at Opryland American Music Festival. Chris Miller returns as the Choral Accompanist and arranger. 5th place at Pekin; 3rd place at Watseka, Best Vocal Sound; 4th at Mt. Zion, Best Male Soloist (Ryan Reed). Grand Champion at Pekin, Best Soloist, Best Instrumental; 2nd place at Watseka, Best Vocal Sound, Best Choreography; 2nd place at Sullivan HS; 6th place at Showstoppers in Chicago. Grand Champion at Lawrence Central HS, Best Vocal Sound; 2nd place at Sullivan, Best Vocal Sound; 2nd Place at Pekin HS; Grand Champion at Showstoppers in Chicago, IL, Grand Champion Soloist (Amy Mattingly). After winning the Chicago Showstoppers Competition, Disney and Keynote Arts & Associates asks CG Sound System to act as the Honors Choir at the inaugural Showstoppers International Show Choir Invitational in Orlando, Florida. 2nd place at Sullivan HS, Best Vocal Sound; 3rd place at Lawrence Central HS, Best Tech Crew; 2nd place at Carroll HS, Best Vocal Sound, Best Female Soloist (Kim Hamilton); 3rd place at Showstoppers in Chicago, IL. 2nd Place at Millikin University, Grand Champion at Highland HS, Best Choreography; Grand Champion at Sullivan HS, Best Vocal Sound, Best Choreography; Grand Champion at Mooresville HS, Best Vocal Sound, Best Show; 2nd Place at Mt. Zion HS, Best Vocal Sound; 2nd place at Edgewood HS, Best Vocal Sound, Judith A. Meeks recognized for a Lifetime Achievement Award; 2nd Place at Showstoppers in Chicago, IL. Judith Meeks announces that the 1994-1995 school year would be her last as the Choral Director at Center Grove High School. A search would begin at the conclusion of the ’93-’94 school year for an assistant director who would take over the head position in the ’95-’96 school year. Grand Champion at Dekalb HS, Best Choreography, Best Tech Crew; 2nd place at Highland HS, Best Vocal Sound, Best Choreography; 2nd place at Lawrence Central HS; 6th place at Mt. Zion HS; 8th place at Showstoppers in Chicago, IL. Dan Andersen, a Choral Director from New Haven HS in northern Indiana is hired as the new Assistant Director at Center Grove HS.